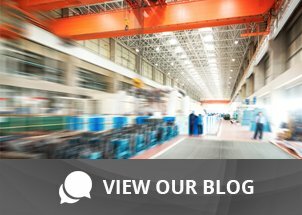 Small size makes a big impact in the warehouse | Taylor Data Systems, Inc. When we think in terms of the warehouse, big equipment, fast-paced tasks, dirt, dust and low lighting come to mind. All of which can be described as just part of the demanding and rugged environment that it is. For most warehouse applications there’s no time to waste, and that includes downtime related to equipment failures and repair. 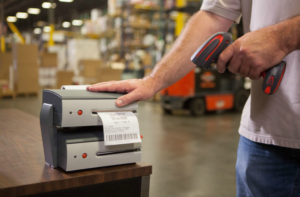 That’s why the makers of most bar code data collection equipment (printers, scanners, mobile computers and more) tout the ruggedness and reliability of these devices – they simply must work in order for operations to run smoothly. Technology today has afforded us the opportunity to make things smaller, faster, lighter and more durable than ever before. We don’t have to put up with wearables that are too heavy for the female wrist, or bar code label printers that won’t fit on the corner of a small table in the shipping department. Giving up speed and reliability for durability just isn’t a factor any more. And this is clearly the case with Honeywell’s MP Series Desktop Industrial Label Printers. The MP Compact 4 Mark III and MP Nova Mark II printers are manufactured to the highest standards and feature a die-cast frame and metal cover for protection, making them durable and reliable in these demanding industrial environments. The MP Series Printers are easy to use, rugged and do as much as large industrial printers, yet need only a fraction of the space. The all-metal casing makes the printers ideal for harsh industrial environments but quiet and small enough to operate in low-noise environments such as an office or hospital. In addition to its small size, the MP Series printers can adapt to most any space in the warehouse – including a wall-mount option to get it up and out of the way in high traffic areas. This includes mounting on manufacturing lines and mobile carts as well. Honeywell even has a ‘mobile’ option for mounting directly to a forklift for easy driver access to bar code labels, and can be mounted in most any orientation, including upside down! The flexibility of these printers brings tons of efficiencies to the workplace and the workforce, their small size keeps workers close to tasks with more usable workspace, without having to take extra time moving from one location to another to get the job done. These benefits all lead to an increase in employee and workflow productivity, as well as a decrease in labor costs and errors associated with manual processes. Don’t be fooled by the size of the MP Series printers. These devices truly know how to handle high-volume applications in demanding environments. See for yourself in this Honeywell case study where competitive printers weren’t making the grade. Then tell us about your application, and we can help you discover greater flexibility, high reliability and employee empowerment in one small package.